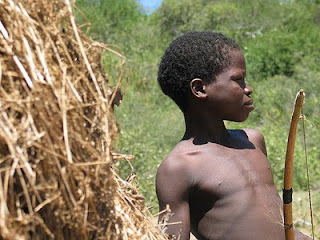 The Hadze tribe in northern Tanzania do not count the time the way we do. They do not count it at all, but just live. Would it not be a relief to flow through the lifetime without chopping it up into seconds, hours or years? Probably yes. However, temporal categories are rooted so deep in my mind that for me it is as impossible to imagine the Hadzi way of life as it is to imagine eternity. I have about ten clocks in my one bedroom apartment. I usually feel like suspended over a precipice if I cannot tell what time it is. I love years. Some of my favourite ones are 1975, 1983, 2007. Not because anything particular happened in them, but just because of their feel. Some are strongly out of my favour, like 1987, or 2006. But I love all of my years, and I like to kiss all of them goodnight. Good things, bad things. Boredom, exhaustion, excitement. Opening up. That's why they are there for - to make me open up and reach out. 2009 will be over in a few days. I still cannot know what its feel will be. I only know what has been happening in it. Have these events made me learn the lessons that were aimed at me? Only experience can tell. And will tell. So, nothing is about years any longer, but about the salt they reap in the end and add to the cone that we have been piling up since our birth. How many grams has 2009 contributed to my cone? I could have learned from anything. Some things in 2009 were huge, though. I started the year in California with my American friends, only to fly back to Washington D.C. a few days later and have brain surgery there on Orthodox Christmas. The first night after I was released from hospital I went to eat in a Burmese restaurant in China Town, and nearly had my head fall into the plate full of noodles. I was terribly high on painkillers. Then I was nursed by an old friend in New York for full nine days, and bought an Ipod in a Radio Shack store on Union Square the day Obama was inaugurated. I loved my six weeks in America, I even went back for a follow-up in July, and I learned a lot. I learned some new things at work. I learned some new things from my students. I travelled to a few places for the first time in my life. I have had love. I have had bas news. I have had anxieties. But where will most of the salt come from this year? The books? I love most of the books that I have read. They gave me insights, primarily into my own opaque world. My friends? Old ones or new ones? Some are so precious. Some have reemerged from the darkness of past. Some have sunk into that darkness. My family? The emotional roller-coaster they always send me riding on? My body? Its imperfections and thrills? Will the salt come from my words? From my bridles? From my surrender? I'd love to let the Hadzi boy reap my salt, unconscious of time slots. But it's my salt and I have to reap it, whether in or out of slots. So, goodnight to 2009. A kiss upon the brow. Sleep well and awake transformed by beauty and hope. And sink back into the velvety feel of the past.